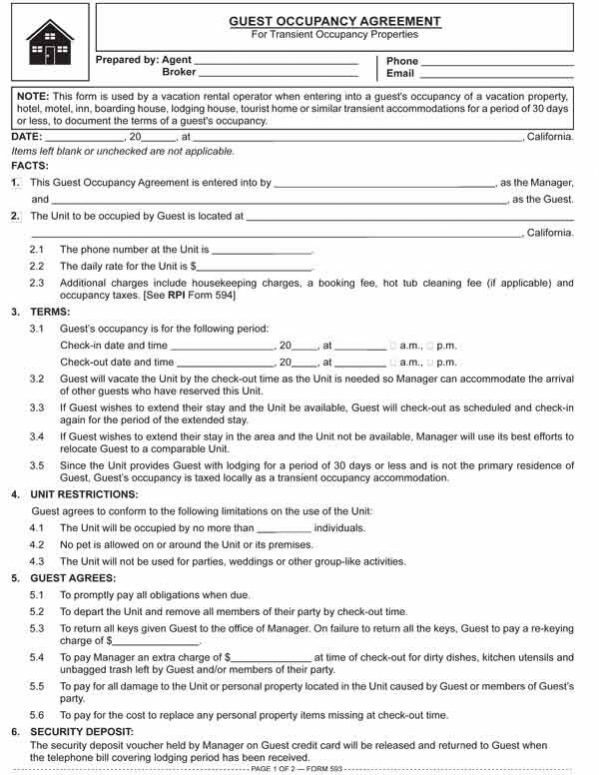 This form is used by a vacation rental operator when entering into a guest’s occupancy of a vacation property, hotel, motel, inn, boarding house, lodging house, tourist home or similar transient accommodations for a period of 30 days or less, to document the terms of a guest’s occupancy. Transient occupancy is the occupancy of a vacation property, hotel, motel, inn, boarding house, lodging house, tourist home or similar sleeping accommodation for a period of 30 days or less. This type of occupant is classified as a guest or a transient occupant. A transient occupant/guest is not a tenant and has considerably different legal standing and obligations. Thus, a transient occupancy is not controlled by landlord/tenant law. A guest occupies property known as lodging, an accommodation or a unit. In the context of transient occupancy, the property is never described as a space or premise(s). Further, the property is not called a rental property. The term “rental” implies a landlord/tenant relationship exists, which it does not, between a guest and owner of the property. The guest’s occupancy is labeled a stay, not possession which is exclusive to a tenant. During a guest’s stay in the lodging, the owner or manager of the property is entitled to enter the unit at check-out time even though the guest may not yet have departed. In contrast, a landlord is not permitted to enter a tenant’s unit without proper written notice when the tenant has not yet vacated. Guests pay a daily rate, not a daily or weekly rent. Guests properly arrive at a pre-set date and time for check-in, not for commencement of possession as granted to a tenant. Likewise, guests depart at an hour on a date agreed to as the check-out time. Unlike a tenant, a guest does not vacate the accommodations, they check out. Form updated 10-2016 to include the Form Description at the top, white header/footer convention and RPI branding. Form navigation page published 10-2016.